/ Modified jul 2, 2015 5:30 a.m.
Earthbound Giant Magellan Telescope will see 10 times better than Hubble. 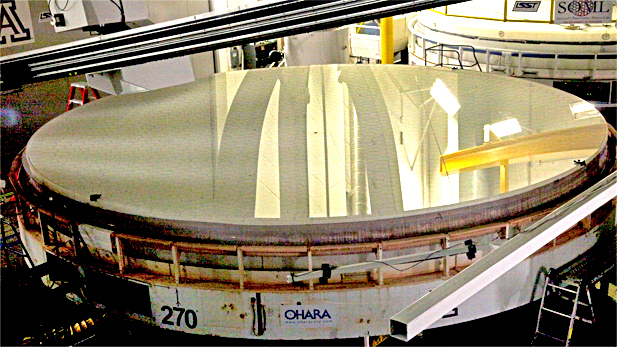 Technicians at the University of Arizona are building seven glass mirrors for the Giant Magellan Telescope, an earthbound instrument scheduled to begin operation on a mountaintop in Chile in 2021. Each mirror will measure up to 27 feet in diameter. They'll be shipped to South America to be arranged in a seven-story tall array high above the Atacama Desert. The bigger the mirrors, the more light gathering power will be available to the scientists. Astronomers expect the Giant Magellan Telescope will see ten times better than the Hubble Space Telescope, which is marking its 25th year in Earth orbit. Buell Jannuzi heads the U of A’s Astronomy department, and he said the Giant Magellan will try to resolve some intriguing questions about the universe. He says the answers will be shared among space scientists in South Korea, Australia and Brazil; alongside researchers at a half-dozen other universities, who are joining forces for the long-range, long-distance project. Astronomers will use the Giant Magellan Telescope to prove some specific theories, like those involving dark matter, thought to be a kind of invisible glue that keeps galaxies from spinning apart. Dennis Zaritsky, who is deputy director at the U of A’s Steward Observatory, admits that the new telescope will likely leave them with new mysteries to solve. Zaritsky jokes that every successful science research paper ends with the words, “more data needed.” He thinks the discoveries coming from the Giant Magellan Telescope are likely to inspire those same words.